Known for both recent economic growth and rich history, Pitman and Glassboro were named to the most desirable Philadelphia suburb list by Philly Magazine earlier this year. But what makes these neighboring Gloucester County towns worthy of such accolades? Glassboro, a town once high on glass manufacturing, is now a bustling hub with shops, boutiques, restaurants, and hotels surrounding the culture of Rowan University. The perfect way to begin the day in any Jersey town? Hit the local diner, and visiting this old-fashioned diner with chrome and red trim is like taking a delicious step in time.. Angelo’s Glassboro Diner, a top 10 finalist in NJ.com’s Best New Jersey Diner contest in 2015, includes early-day favorites like a Western omelette for $6.70, a scrapple, egg, and cheese sandwich for $5.20, and a short stack of hot cakes for $3.70. We tried a plain egg omelette and it was egg-cellent — fluffy, cheesy, and filling. Ground was broken for the Rowan Boulevard redevelopment project — a $350 million project linking the university to Glassboro’s downtown retail district — in 2009. The area has since become a destination for lovers of dining, shopping, entertainment, and art. Visitors can start at the Rowan University Art Gallery at 301 High Street where local artists and students display unique art such as the current exhibit, “How Food Moves: Edible Logistics.” Next, visit one-of-a-kind shops like Treasures on Broadway or Forever Young Emporium. If the kids would rather play outdoors, take them to New Street Park at 410 New Street to some fun on the community-built, $75,000 playground. With walls lined with big screen televisions airing every sports show or game at any given time, and a kitchen full of Philly favorites, Tony Luke’s is a great place to stop for lunch. We indulged in a cheesesteak with Whiz and fried onions for $8.75. And as usual, Tony Luke’s delivered. While Tony Luke’s is technically a chain restaurant, it’s a local establishment where flavor and freshness is competitive with any local mom and pop sandwich shop. Other menu favorites are the chicken cutlet parmesan for $9.25, and the roast pork Italian for $9. If you’re looking for a drink and a view of the bustling college town to complement your lunch, try the Landmark Americana. Expect this new patio opened last September to be the talk of the town this spring and summer. The bar offers several New Jersey craft beers on tap including Bolero Snort Strawbully Fields and Cape May Foreshore at $6, and Glasstown Lunch Pale Ale for $5. Pair your beer with an appetizer, sandwich, or the three-taco platter, which we enjoyed, with varieties such as smoked chicken for $10.99, sesame tuna for $13.99, or Asian short rib for $10.99. And if you’re looking for some late night fun, head to the Landmark after dinner for some late night fun. The bar and grill hosts Club Night every Thursday and Saturday from 9 p.m. to close, with music, dancing, craft beers, and always a great crowd. On May 5, celebrate Cinco de Mayo at the Landmark with $3 Mexican beers, $3 Margaritas, and $4 Cuervo shots all day. Just blocks from Rowan University, the Landmark Americana is the place to be for a late-night party. At the end of Rowan Boulevard, stretching to the intersection of Main and High streets, the 1.75-acre Town Square features a great lawn, stage terrace, a paver plaza, interactive spray fountains, two pavilions, an art garden, and the Veteran’s Memorial Plaza to honor America’s veterans. Guests are invited to gather in the plaza for a solemn ceremony following the upcoming Glassboro Memorial Day Parade on May 29. If a sip of wine is more your style, head to Summit City Winery. Established in 1922 as Boulevard Orchards, Summit City offers 30 varieties of wine; you will find traditional reds such as Summit Red, and whites like Summer Delight. Also try fruity wines like apple, kiwi, and mango. As fans of fruity whites, the Peach wine was our personal favorite. Summit The winery is only open Friday from 4 to 7 p.m., Saturday from 1 to 7 p.m., and Sunday from 1 to 6 p.m. Hours are extended to 10 p.m. on Friday and Saturday music nights, so plan accordingly. Less than 10 minutes drive north of Glassboro is the ever-growing borough of Pitman. Similar to Glassboro, Pitman is growing into a retail and dining destination, but for the more mature crowd. With the Broadway Theatre of Pitman running popular musicals, concerts, and children’s shows, and restaurants like Sweet Lula’s by Chef Anthony Asbury, Pitman is becoming a tiny broadway right here in South Jersey. One of the community’s newest additions is the Pitman Gallery and Art Center. Upon entering the stylish, modern gallery, the traffic noise of South Broadway is left behind. The gallery is urban chic, yet welcoming. Art aficionados as well as newcomers to the world will feel captivated and comfortable in this quaint yet posh space. The amazing water colors of South Jersey artists Yvonne Pecor Mucci and Linda D’Urbano are currently on exhibit through May 27. Classes in painting, photography, and writing are also offered at the center. If all that art gazing wears you out, head to the newly reopened Broadway Bakery for delicious donuts at $12 a dozen, gourmet cupcakes for $2 each, and the signature Pitman pastry, the Bismarck, either glazed for $1.65 or with chocolate frosting for $1.75. The Bizmarck is a huge coffee roll-cinnamon bun combo that you’ll need two hands to hold — we couldn’t finish it in one sitting. Broadway Bakery’s Christina Mastrocola said everything is fresh baked every day. 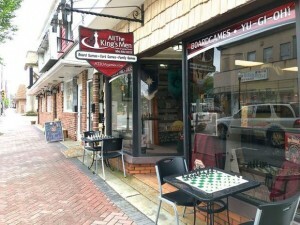 The shops that line Broadway in Pitman include a variety of retailers such as Pitman Jewelry Shop at 24 S. Broadway and Crossroad Comics and Collectibles at 23 S. Broadway. A Touch of Ireland at 5 S. Broadway offers food, clothing, jewelry, music, and gifts imported directly from the Emerald Isle. Victoria Garden at 48 S. Broadway carries one-of-a-kind home decor such as tea sets, wall prints, and silk designs. Stroll Broadway and stop in at one or all of these fine retailers. Pitman’s dining district continues to grow, and the newest eatery offers something quite different from Chef Anthony Asbury, owner of Sweet Lula’s — just two doors down at 28 S. Broadway. His Tex-Mex restaurant, Coco’s Cocina at 32 S. Broadway, opened its doors about a month ago. With Asbury’s own Coco’s Cocina Hot Sauce readily available, spicy is a guarantee if that’s your taste. Burritos, tacos, and nachos, all which can be spiced up with Asbury’s own hot sauce, are available at this fiesta-style cantina. These hand-formed, 100 percent Angus chuck burgers made famous during their time serving at a luncheonette at Cowtown in Pilesgrove. While there is a Thai burger — mixed with chili and garlic and topped with sriracha sauce — the cafe’s burger menu includes choices such as the stuffed bacon cheddar burger for $10, and the mac attack burger, topped with mac and cheese, cheddar cheese, and bacon for $11. The menu also includes traditional Thai dishes such as Pad Thai for $11, Drunken Noodles for $11, and Thai Chicken Noodle soup for $8. Open for nearly four months, owners Selami Cakir and Nedret Kurt suggest making reservations for dinner at this unique eatery. The menu here is different from any other you will find in the area. The Chicken Adana, for $11.99, is not only a delicious take on seasoned and grilled chicken, but it’s also beautiful. The tender chicken strips are shaped into what looks almost like a strip of bacon, grilled and laid atop a bed of rice. If you’re looking for something more casual, a Turkish pizza, or Pide vegetable mix for $9.99 is perfect. The thin, crispy dough is folded into a canoe shape, and loaded with fresh vegetables and spices. Perfect to share or keep all for yourself. Originally opened in 1926, the Broadway Theatre of Pitman offers mainstage productions, children’s shows, musical events, and summer camps for kids. Check their website for show schedules and be sure to catch a performance while in Pitman. This quaint bed and breakfast has four guest rooms to choose from to end your day in the Pitman area. Rooms range between $149 and $169 per night which includes all amenities and breakfast each morning. If you’re not quite ready to call it a night, head back to Glassboro where there are plenty of bars that cater to the late-night, college party crowd. PB’s Diner and Tap Room has more than 20 beers on tap, an outdoor patio, and music and dancing on select evenings. As a bar in a college town, this establishment is one of a few favorite hangouts for the early 20s crowd. So, if you like a party, check out PB’s Diner during the late night hours. Hungry? Grab a Smoke House burger for $9.99, 20 Buffalo wings for $16.99, or a Smoked BBQ pork thin crust pizza for $9.99.